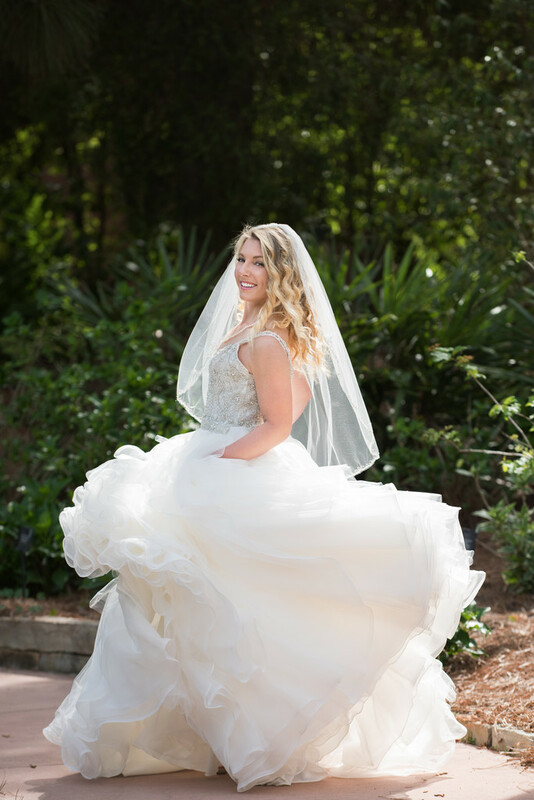 All of those amazing layers by Mori Lee must be shown off with a few spins, twirls and twists. Gown was purchased from I Do Bridal and Formal. This portrait was taken at Mobile Botanical Gardens on a spring day. It is no surprise that Moible has a huge botanical garden given its French history. Below is an excerpt from a brochure printed in 1977 by the South Alabama Botanical & Horticultural Society for fundraising purposes. "Horticulture and gardening have always been a part of Mobile’s life. The French who came to found the city had instructions from Louis XIV to collect and send back botanical specimens, and Iberville, busy with the establishment of a great new colony for the glory of France, was careful to obey his King’s instructions. When Mobile was laid out at its present site, one of the first things done was plant a double row of trees around the esplanade to provide a shady walk. Vegetables from France grew in kitchen gardens, and early in our city’s history it was possible to gather at short notice the ingredients for the same salad one might order in Paris. A plan of Mobile published in 1765 shows several small formal gardens with walks and parterres laid out in a fashionable European style. Most of these were probably herb gardens, but some seem to have been purely ornamental."